We are a charming six acre working homestead in Eliot, conveniently located 4 miles from historic Portsmouth, NH. We offer cozy accommodations & a daily organic self serve breakfast options. With 18th century charm, Shilo Farm offers comfortable accommodations with rejuvenation and convenience in mind. The feel of the home has been described as rustic elegant with an eclectic flair. Our walls are filled with a unique collection of original art for inspiration and reflection. GENERAL ACCOMMODATION DETAILS: We currently have three spaces available: The Farm House Suite and the Skylight Suite are located in the main home. The Barn Retreat is a stand alone dwelling across the driveway. It is equipped with a small kitchenette. All have private bathrooms and share the kitchen and all common spaces (ie the Dining Room and Living Room). Descriptions are listed below. Enjoy the serenity of the landscape while you sip on your morning coffee or tea. We invite our guests to join us in morning animal chores of collecting eggs and feeding the goats. Our fire pit is a wonderful evening activity after a day at the beach or enjoying the sites of Portsmouth. FOR RESERVATIONS: You can click on the Link besides the listings, or you can contact us directly. The Farm House Suite is perfect for a couple or a family. It has a private entrance and includes a queen bed and twin day bed in the Master bedroom, a full bath with soaking tub, a 3-season sunroom/yoga/exercise room and a Living Room/Library which has a new queen sleeper sofa and additional day bed. Please note that the Community Kitchen is adjacent to the Living room and you will be able to hear sounds from the kitchen from that space. PRICING: Our listed price of $175/night is based on double occupancy. If you are traveling with a child or additional friends or family, there is a $44 surcharge per additional adult/child and a $30 cleaning fee. CLICK HERE TO MAKE A RESERVATION. Because we believe that sleep is one of the main pillars of health, we have invested in a Queen SLEEP NUMBER bed to ensure a restful and rejuvenating night of sleep. We use only ORGANIC linens and towels and non-toxic cleaners. The Skylight Suite is perfect for a couple, a family with two children or 4 adults (each with their own beds). The suite has a Queen Sleep Number Bed and a twin bed. The second pocket bedroom has a built in twin daybed and there is a boat berth style sleeping nook that houses a twin bed. There is a private bathroom with a stall shower as well as a shared half bath downstairs. Please note: We do not have air conditioning, so it can get quite tropical in the depth of summer. We have fans for your use. The kitchen is fully equipped and open to all guests. It is far from the bedroom, so your peace will not be disturbed. PRICING: Our listed price of $155/night is based on double occupancy. If you are traveling with a child or additional friends or family, there is a $44 surcharge per adult/child and a $30 cleaning fee. CLICK HERE TO MAKE A RESERVATION. Nestle into your very own nook with twin mattress, organic linens & a plethora of pillows. 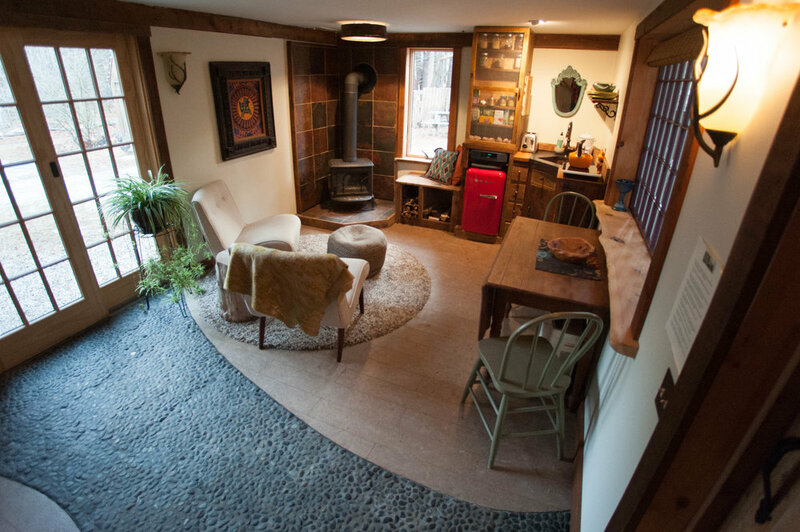 The Barn Retreat is a unique opportunity to stay in a completely renovated self contained apartment (cozy at 500 square feet) within a working barn. No detail was overlooked during the creation of this space; from the river rock path inlayed in a cork floor to a shower flanked by two cedar tree trunks harvested from the property. 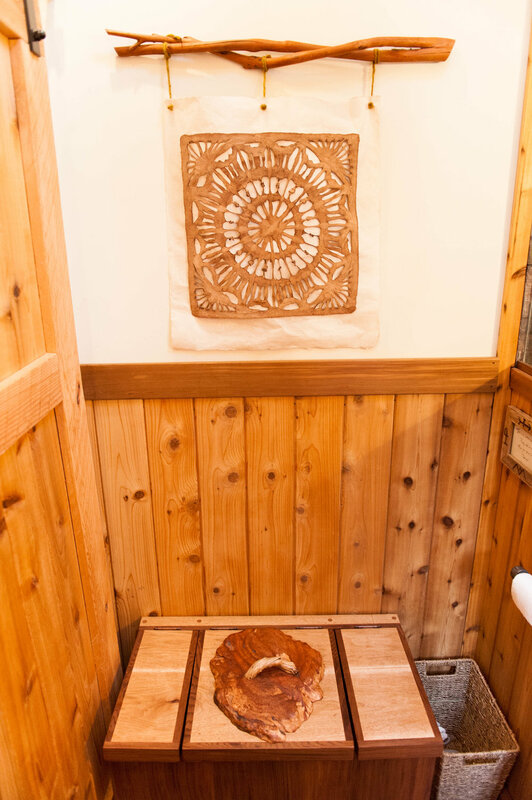 On the first level there is a custom built composting toilet made from western red cedar and a locally harvested cedar burl. There is a wood stove as well as a Rinnai Heater for those chilly nights and fans for the steamy ones. There is small refrigerator/freezer, a soapstone sink and hot plate for tea/coffee or frying up a farm fresh egg..
Sleeping arrangement: There is a King Sleep Number bed on the second level. The King Bed can also be split into twin beds for retreats. Within that same room are two lofts with twin beds. The lofts are accessed by a steep ladder and overlook the King bed. This unit is best suited for a family or bunk style with four adults. 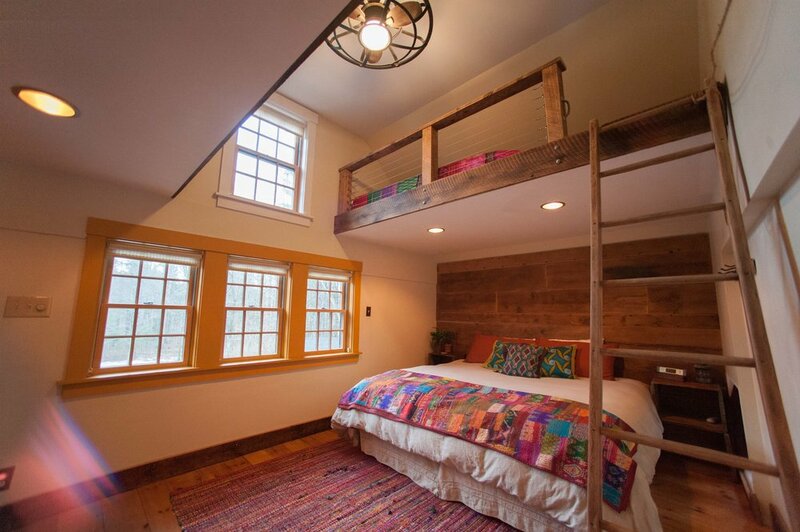 PLEASE NOTE: The loft bunks are small and similar to a boat bunk. Not suitable for folks greater than 6 feet or 250 pounds. We also ask that children under the age of 7 do not sleep in the lofts due to their height. PRICING: Our listed price of $185/night is based on double occupancy. If you are traveling with a child or additional friends or family, there is a $44 surcharge per additional adult/child and a $30 cleaning fee. You also have access to the main kitchen and the community "Green Room" and Dining Room. CLICK HERE TO MAKE A RESERVATION. Because we believe that sleep is one of the main pillars of health, we have invested in a KING SLEEP NUMBER bed to ensure a restful and rejuvenating night of sleep. We use only ORGANIC linens and towels and non-toxic cleaners. The KING BED can be converted into twin beds for a bunk style retreat experience. Have you ever wanted to experience Tiny House Living? - well, now you can! Welcome to The Shilo Woodland Tiny House. It is a seasonla 18' Tiny House nestled in the woods, complete with a full shower, composting toilet, kitchenette with cook surface and mini-fridge. The double bed acts as a couch or pulls out to a full bed. there is a large projector screen and projector that can be hooked up to your phone to watch movies. Wifi is spotty in this unit, so you will need to use your phone data. This fun and funky Tiny House is the perfect home base for an individual or couple seeking adventure, culture, or just a little time "off the grid". The Main Kitchen, Living "Green" Room and Dining Room are available to all guests & day students. The kitchen is fully equipped with all the modern amenities with a coffee maker, blender, french press, toaster, etc. There is ample cupboard space for additional provisions and there are place settings for twelve, as well as cloth napkins. We love games and possess a collection of board and card games in the Green Room. Quiet hours are from 10pm - 9am. There is a four burner gas stove, as well as an antique cookstove available for use. The cupboards and fridge are stocked with basic condiments and spices. We provide provisions for a self serve breakfast of farm fresh organic eggs, milk, OJ, bread, butter, jam and assorted organic cereals and granola. Tea and Coffee supplies are provided as well. We have a television with limited cable, but access to Apple TV, Netflix, Hulu, etc. There is antique writer's desk, children's Bathtub Reading Nook and a cupboard full of board games, puzzles and children's toys. Located off the Kitchen and available for all guests. Rent Exclusive use of the Farmhouse Suite, Skylight Suite A & B(not shown), Bird’s Nest Nook and Zen Den. We have enough beds to sleep 8 - 13 folks. Unit pricing based in double occupancy (Total: 8). Additional people: $44 each. Please CONTACT US directly, so we can adjust the pricing accordingly. Cost: $600.00-800.00/night, depending on number of guests. If you wish to host a larger gathering, please inquire for special pricing. PRIVATE PIZZA PARTY using our outdoor earthen cobb oven. We will get the oven warm, give you some tips and you provide the ingredients. BUILD A SNOW CAVE…and sleep in it! Get a MASSAGE. Give us at least 72 hours notice and we will book an in house MASSAGE for you. The service fees are non-refundable. Cancellation policies may be superseded by the Guest Refund Policy, extenuating circumstances, or cancellations by the hosts for any other reason permitted under the Terms of Service.